Unless the goose was counting its chickens before they hatched instead of the clichés in this one. Read the full review of Going Rogue. You can also read about the Delete Key Awards at @janiceharayda on Twitter. The 10 finalists are being announced in random order, beginning with number 10. This is finalist #9 The winner and runners-up will be named on March 15. 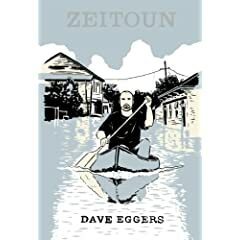 Zeitoun. By Dave Eggers. McSweeney’s Books, 349 pp., $24. Like Infidel and A Long Way Gone, Zeitoun tells such an important story, you wish you could believe more of it. Dave Eggers gives a captivating if hagiographic account of the plight of Abdulrahman Zeitoun, a well-off Syrian-born painting contractor and landlord who refused to leave New Orleans when the mayor ordered a mandatory evacuation of the city during Hurricane Katrina. As the book has it, Abdul Zeitoun stayed to look after his buildings when his wife and four children fled to Baton Rouge. Then he traveled by canoe through the flooded New Orleans streets, performing humanitarian acts such as rescuing trapped people and feeding abandoned dogs. The Federal Emergency Management Agency was not impressed. More than a week after defying the evacuation order, Zeitoun was arrested. And he says his jailors refused to let him to make a phone call — to his wife or anyone else – and deprived him of other rights while implying that he belonged to the Taliban. This scene, on first reading, seems heartbreaking. But it holds up poorly under scrutiny. Zeitoun casts himself as wholly innocent, but his repeated entry into a stranger’s house was – for however worthy a reason — tempting fate when the police were watching for and arresting looters. And the incident reflects questionable dog behavior. Eggers says that after feeding the abandoned pets, Zeitoun left a window open so they would have fresh air. Dogs can swim and leap out of windows. And Eggers gives us no reason to believe that the dogs he describes, in their desperation, wouldn’t have tried. Like much else in Zeitoun, the incident may have unfolded exactly as he says. Or it may be nothing more than a great story. Best line: “This day he ventured closer to downtown, passing families wading through the water, pushing laundry tubs full of their possessions. He paddled by a pair of women pushing an inflatable baby pool, their clothes and food inside.” Zeitoun has many details like these that make you see life in New Orleans after Hurricane Katrina hit. Worst line: “Laying on sweat-soaked sheets, he had a thought.” Was one of those thoughts: What’s that difference between “lie” and “lay” again? Furthermore: Eggers’s books include A Heartbreaking Work of Staggering Genius and What Is the What, a National Book Critics Circle Award finalist about the civil war in Sudan. You can also follow Jan Harayda (@janiceharayda) on Twitter at www.twitter.com/janiceharayda. She satirizes American literary culture, including the book publishing industry, at www.twitter.com/FakeBookNews. You can also follow Jan Harayda (@janiceharayda) on Twitter www.twitter.com/janiceharayda, where she has posted other comments on Sarin Palin’s memoir. Does Sarah Palin Deserve a Delete Key Award for Bad Writing for ‘Going Rogue’? The Delete Key Awards have shown through finalists James McGreevey and Newt Gingrich that neither Democrats nor Republicans have a monopoly on bad writing. Should a politician make the 2010 shortlist due out in February? I haven’t read Going Rogue, but reviews suggest that it could be a candidate. Does Sarah Palin deserve to become a finalist for a Delete Key Award for bad writing in books? If you’d like to nominate a line from Going Rogue or another book by a politician, please use the address on the “Contact” page on this site or send an message on Twitter to @janiceharayda that includes the sentence or keywords from it. A line from Notorious New Jersey that I’ve been thinking about since last week’s corruption sweep: Jon Blackwell noted that when the governor asked residents to suggest new slogan for the state back in 2006, someone proposed “Most of Our Elected Officials Have Not Been Indicted.” How long would that one have been true even if it hadn’t lost to “New Jersey, Come See for Yourself”? Update, 9:50 p.m. July 29: Jack Shaw’s autopsy is “inconclusive” pending more toxicology reports. The New Jersey corruption scandal has deepened with the apparent suicide of Jack Shaw, a Jersey City political consultant who was among 44 people charged Thursday in a federal probe aided by a real-estate developer-turned-informant who wore a wire. McGreevey’s memoir has problems well documented by the reviewers and op-ed page columnists who wrote about the book when it appeared in 2008, but The Confession also has many quotes like this one that help to put the latest scandal in context. Tags: Book Reviews, Books, Crime, Criminals, Kellogg's Cereals, Life in the USA, Money Laundering, New Jersey, Operation Bid Rig, Political Corruption, Politics, Rabbis, Review, Scandals, U.S.
Wonder why some residents of New Jersey weren’t surprised when law-enforcement authorities arrested dozens of people Thursday in a political corruption and money-laundering probe that involved rabbis, mayors and a defendant said to have stuffed $97,000 in cash in a box of Apple Jacks? Read Jon Blackwell’s Notorious New Jersey: 100 True Tales of Murders and Mobsters, Scandals and Scoundrels (Rutgers University Press, 2007). This lively book looks back on sordid events in Garden State history from the 1804 Aaron Burr-Alexander Hamilton duel in Weekhawken to the 2002 murder conviction of the philandering Cherry Hill rabbi Fred Neulander. Blackwell argues that crime thrives in New Jersey because, with 566 municipalities, the state has “many nooks and crannies where bribery can flourish.” That’s true as far as it goes, but former Star-Ledger reporter Brad Parks offers a fuller explanation in his “Poison Ivy in the Garden State” in the July 25–26 Wall Street Journal. A review of Notorious New Jersey appeared on October 20, 2008. What’s So Great About ‘Empathy’? But is “empathy” really better than detachment, or the ability to stand back and analyze a situation objectively? Mark Steyn argued that it isn’t in a recent issue of Maccleans, the Canadian weekly. Steyn is more conservative than I am on many issues, including some that he discusses in “What Price Our Pseudo-Empathy?,” but he writes with verve and intelligence about a form of language abuse that occurs at many points on the political spectrum and in novels as well as political speeches.